24 October 2007 (Science Daily) – A report on the collaboration between the University of Pennsylvania Museum of Archaeology and Anthropology’s Ban Chiang Project and Laos’ Department of Museums and Archaeology and the results of the last few year’s work of surveying the area around the Mekong River for archaeological potential. As archaeologists in the last half century have set about reconstructing the prehistory of Southeast Asia, data from one countryâ€”centrally located Laosâ€”was conspicuously missing. Little archaeology has occurred in Laos since before World War II, and beginning in the mid-1970s, Laos shut its doors completely to outside researchers. International scholars had to content themselves with information from excavation and survey work mostly from neighboring Thailand. That scenario is beginning to shiftâ€”and new data, as well as new collaborative relationshipsâ€”may forever change our perspective on an area that was once considered a â€œbackwater regionâ€ of human civilization. Dr. Joyce White, Senior Research Scientist at the University of Pennsylvania Museum of Archaeology and Anthropology and Director of the Museumâ€™s Ban Chiang, Thailand project, has long believed that the key to understanding the early prehistory of the entire region lay in Laos, especially northern Laos, along the middle portion of the great Mekong River. For nearly a decade, she has been laying the groundwork for a long-term, international collaborative project with Laos. Today she is co-director, with Bounheuang Bouasisengpaseuth, Deputy Director at the Lao National Museum, of the Middle Mekong Archaeology Project, a collaborative effort of the University of Pennsylvania Museum and the Department of Museums and Archaeology (DOMA) in Laos. The Middle Mekong Archaeology Project (MMAP) completed its first test excavation season in Laos in July 2007, two years after a remarkable survey season in 2005, and Dr. White is more optimistic than ever that the region, a virtual terra incognita among archaeologists until now, holds great promise to provide important pieces to the puzzle of human habitation and settlement during Southeast Asian prehistory, a period reaching back into the late Pleistocene at least 20,000 years ago. In 2001, Dr. White first visited Laos for an archaeological assessment survey of the region around Luang Prabang, by the great Mekong River and its nearby tributaries. She had less than three days to make her assessment: did this area have the potential to aid archaeologists in the reconstruction of Southeast Asian prehistoric history? The March 2005 month-long survey season, sponsored by the National Geographic Society, and the National Science Foundation High Risk Archaeology Program, bore out that early assessment. The MMAP survey group, a collaboration of U.S., Lao, British, Australian, and Thai colleagues, divided into two separate teams for rapid surveys of three tributaries of the Mekong River in Luang Prabang province. In that brief time, more than 58 archaeological sites were identified in a rugged, 580 square mile region. The MMAP project is especially interested in finding likely sites from the middle Holocene period (roughly 6000-2000 BC). This period saw a transition from communities based on game hunting and wild-plant gathering to settlements practicing plant cultivationâ€”the time when human settlements shifted from primarily hunter-gatherer to primarily agricultural lifestyles. Of the more than 58 sites identified, 9 held promise as being from this time period. Training a new generation of Lao collaborators in state of the art archaeological techniques is an important long-term goal of the project, and in 2005 the teams used mobile GIS (Geographic Information System) technology, along with digital photography, to evaluate data from many sites, and to do it more efficiently than would have been possible with more traditional recording methods. 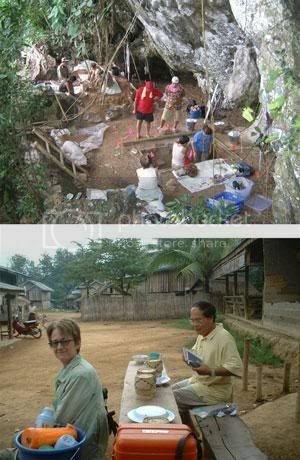 The 2007 test excavation site, the Phou Phaa Khao Rockshelter site, provided Dr. White and her team with new challenges, as she worked with an enthusiastic but variably-trained group of collaborators at this cave 30 miles by mostly dirt road from Luang Prabang cityâ€”outside the range of cell phone signals or electricityâ€”during the unpredictable rainy season. Although there was no specific evidence to suggest this site was used during the middle Holocene period, the site had strong evidence of human occupation and settlement during both the stone age (10,000 to 5,000 years ago) and the iron age, sometime after about 3,000 years ago. Parts of seven human burials, more than 2,300 fragments of stone artifacts, probably from manufacturing stone tools, and a variety of both earthenware and stoneware ceramics were excavated by the team. For the next step, the MMAP team hopes to continue test excavations at additional sites on other tributaries of the Mekong River, looking especially for Middle Holocene evidence, but carefully collecting whatever data is unearthed. The research will simultaneously help develop infrastructure for Lao archaeology and train the next generation of Lao archaeologists. â€œIt is in these excavations, strategically selected and painstakingly carried out, that we will build a lasting understanding of human settlement prehistory in this region of the world,â€ said Dr. White. Sorry for the late reply John, I have forwarded your message to Dr White, and hopefully she gets in touch with you.